No BYO but pints for $7.50 (mid-strength $7.00 ) and a variety of menu choices under $20.00. From Perth find Hale Road,(Wembley Downs) right into Weaponess Rd ,left into Sonia St at the roundabout, right into Corbett St, left into Ventnor St, LFF. Only one hill here. North on Mitchell Fwy, Left onto Whitfords Ave, Left onto Marmion Ave, Left into Forrest Rd, LFF. 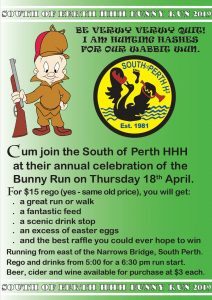 Bunny Run on Thursday 18th April. Running from east of the Narrows Bridge, South Perth. Rego and drinks from 5:00 for a 6:30 pm run start. Beer, cider and wine available for purchase at $3 each.